If you are looking for a fast, easy and yummy dessert.You don’t need to look any further. Easy Banana Puffs are made with a total of four ingredients. 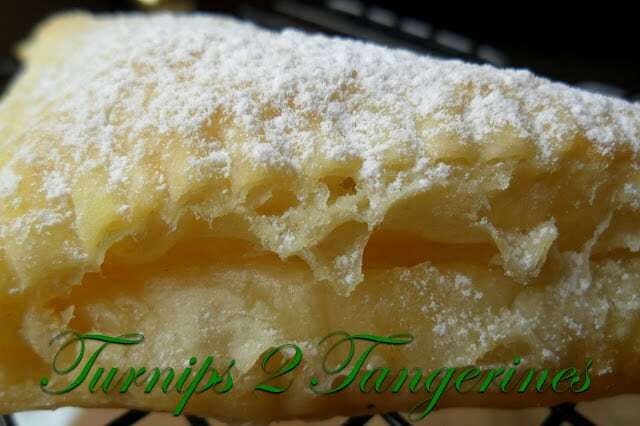 One of the ingredient used in this super easy recipe is a package of frozen puff pastry thawed, one 21 oz can of banana cream pie filling or use your favorite flavor, milk to seal the edges together and a dusting of powdered sugar. Doesn’t get much easier than that now does it! So make dessert tonight and give these banana puffs a try! 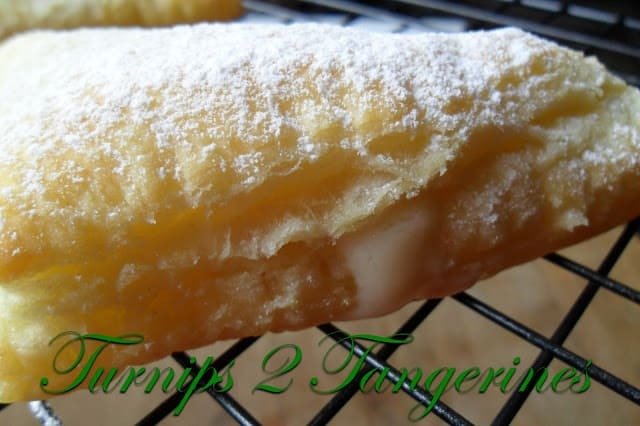 What is Frozen Puff Pastry? The French call this rich, delicate, multilayered pastry, Pate Feuilletee. It’s made by placing pats of butter between layers of pastry dough, then rolling it out, folding it in thirds and letting it rest. This process, which is repeated 6 to 8 times, produces a pastry consisting of hundreds of layers of dough and butter. When baked, the moisture in the butter creates steam, causing the dough to puff and separate into hundreds of flaky layers. 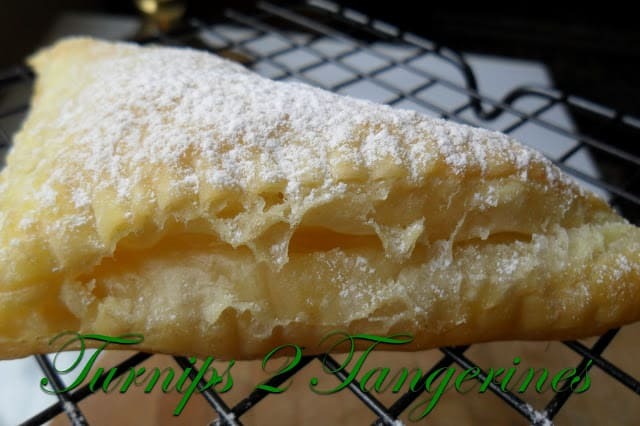 Puff pastry is used to make a variety of crisp creations including croissants, napoleons, palmier, and allumettes. 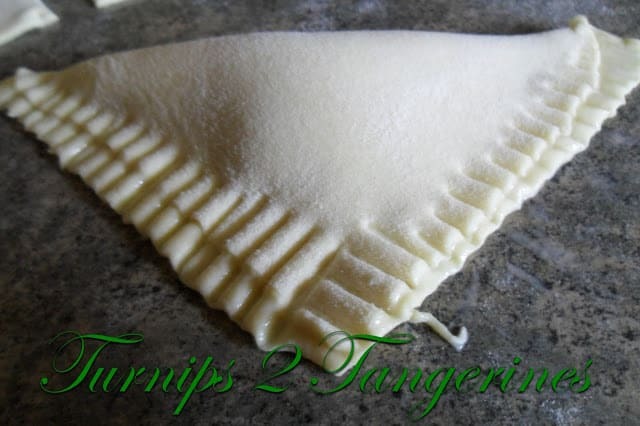 Puff Pastry is also used as a wrapping for various foods such as meats, cheese, fruit and salmon. Don’t like banana cream pie filling? 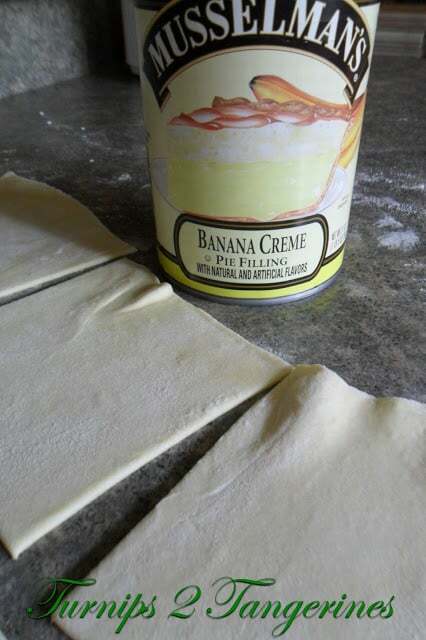 Didn’t know they even made canned banana cream pie filling? Then fill these puffs with your favorite fruit pie filling, coconut cream, lemon or chocolate pie filling. 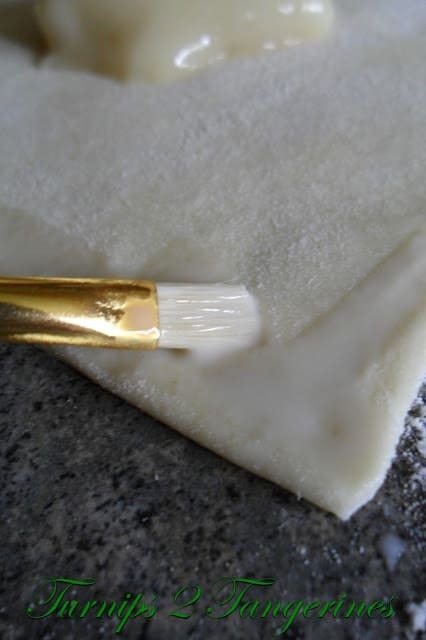 On a lightly floured surface, roll 1 of the pastry sheets into a 12-inch square. 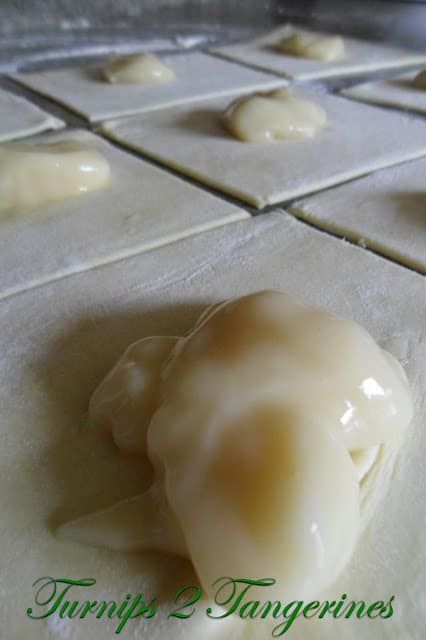 Cut into 6 squares (see photos) Top each square with about 2 teaspoons pie filling. Brush pastry edges with milk. 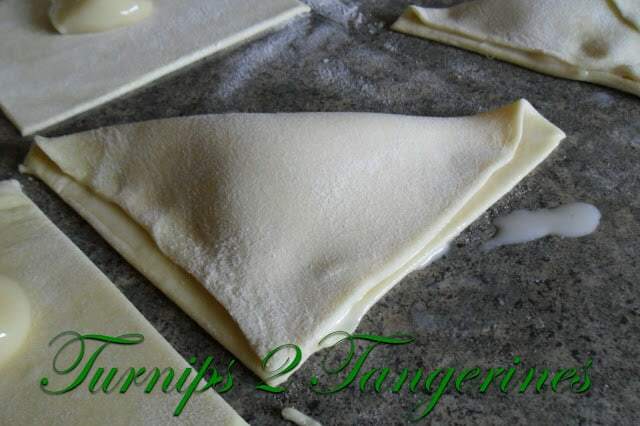 Fold in half diagonally, seal edges by pressing with the tines of a fork. Place on an ungreased baking sheet. Repeat with remaining pastry sheet and filling. Bake in a 400º oven 12 to 15 minutes or until golden brown. Cool on wire rack. 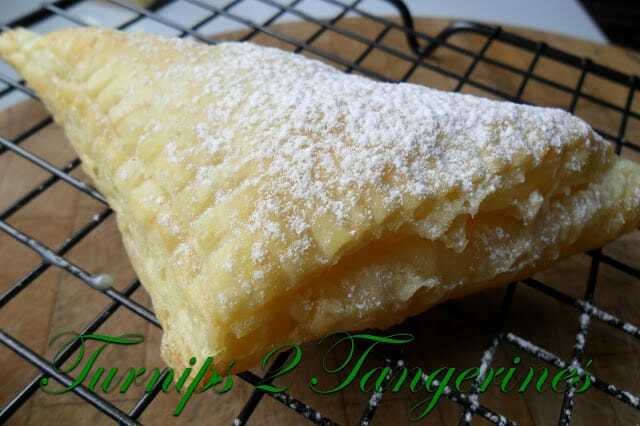 Here are a few recipe ideas using puff pastry. Venison in Puff Pastry, Morello Cherry Cream Cheese Danish and Brie in Puff Pastry. What a great idea, these Banana Puffs look yummy! Hope you have a wonderful week end and thank you so much for sharing with Full Plate Thursday.